If you are at a loose end during May and fancy some outdoors activity why not try the Fiery Rooster challenge? It is the Chinese Year of the Rooster and at each of the following five sites you will see a poster on the noticeboard with a question. To get the answer go to the next site. The five locations are The Upper Orchid Field, The Community Orchard, The Elizabethan Orchard, the watercress beds at Goldsland Farm and the Wild Orchard. You can start at any point but then need to follow them in order. First correct answer wins £20 of Garden Vouchers; second gets £10. Check Facebook to see if the prizes have been won. Take pencil and paper or some other means of recording the answers. On Thursday 25th May we shall be leading an orchard walk as part of the Vale of Glamorgan Walking Festival. We start at 11am outside the church and the walk of around 5 miles will take in the Community Orchard, Elizabethan Orchard, Wild Orchard and Upper Orchid Field. No booking necessary but bring lunch and wear stout footwear. If you know your way around the area and 5 miles seems too much you can join us for a while and then make your own way home. 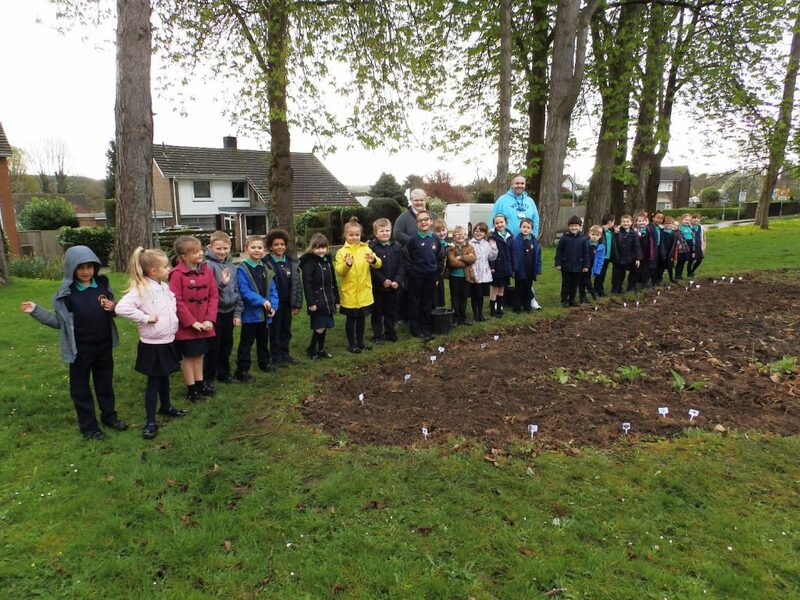 Pupils from Wenvoe Primary School helped us again this year to spread wildflower seed on the bed in Grange Park. They were impeccably behaved and found out, amongst other things, how bees are saving wild elephants in Africa. Elephants have an aversion to bees so by placing hives around the perimeter of the village the elephants are deterred from muscling in and consuming the crops, hence reducing conflict and the prospects of villagers taking retaliatory action. This month the group has arranged for the erection of another noticeboard and bee hotel, this time at Goldsland Farm (featured on Radio 4's Farming Today). We have put up four new raised beds, 2 insect homes, 3 butterfly boxes, 3 nestboxes, 4 hedgehog homes and planted 3 Rowan, 3 Wild Cherry and 3 Crabapple along with the native Yellow Water Lily, Flag Iris, Flowering Rush and Purple Loosestrife. As always there is masses to do around the sites so if you fancy doing a bit of conservation work, do get in touch.